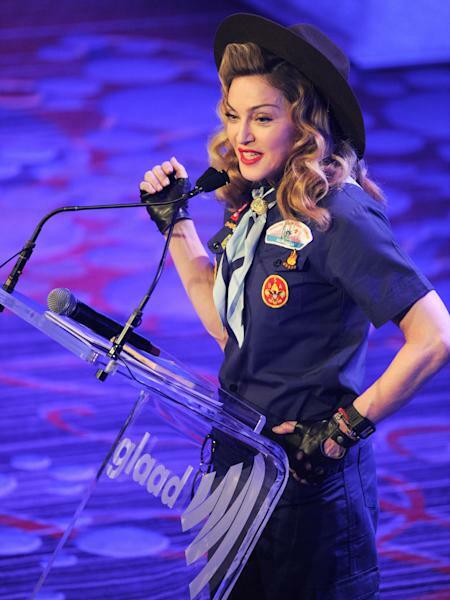 NEW YORK (AP) — Wearing a replica of one of the organization's uniforms, Madonna called on the Boy Scouts to lift its ban on gays while also calling for a "revolution" to prevent discrimination and abuse of the gay, lesbian, transgender and bisexual community. Speaking Saturday night at the GLAAD Media Awards, Madonna started off in a mischievous mood. She joked that she wanted to become a part of the Boy Scouts herself, but was turned down, even though she had the qualifications. "I can build a fire. 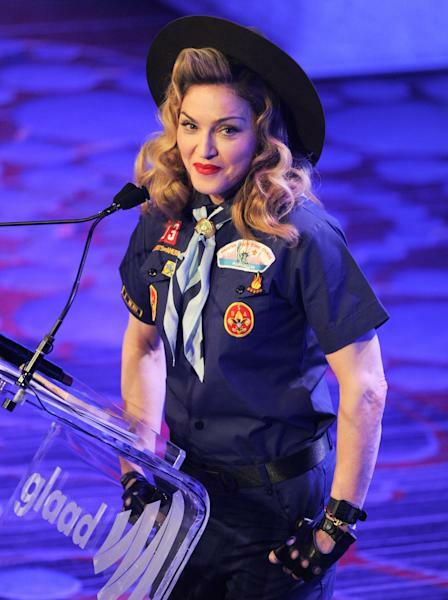 I know how to pitch a tent," said Madonna, sporting a Boy Scouts troop leader hat and a blue shirt and shorts set that included replicas of Boy Scout badges. "I can rescue kittens from trees. . Most importantly, I know how to scout for boys," she said, before adding, "I think they should change their stupid rules." The Boy Scouts of America does not permit openly gay people to serve in the organization — a decision that has come under increasing fire over the years. Later, she got serious as she talked about the conflicts in the world and of the bullying of young gay, lesbian and transgender people. "When I think about young kids in America who are being bullied and tortured, who are taking their own lives because they feel alone and judged, outcast and misunderstood, I want to sit down and cry a river of tears," Madonna said. Noting that she has teenagers herself, she said, "It's an atrocity to me, I don't accept it." Later she said, "I don't know about you, but I can't take this (expletive) anymore. That is why I want to start a revolution. It's 2013 people. We live in America, land of the free and home of the brave? That's a question, not a statement." 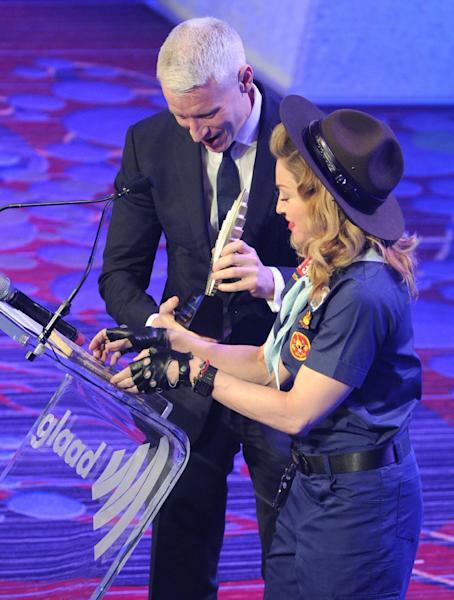 Madonna was on hand to give the Vito Russo Award to CNN anchor Anderson Cooper. She lauded Cooper for standing up for the rights of others. Also honored by the Gay & Lesbian Alliance Against Defamation was the NBC musical series "Smash," the documentary "How To Survive a Plague," and "The Amazing Race." Brett Ratner was also given the Ally Award — a turnaround from 2011, when the organization condemned the director for using an anti-gay slur, and he stepped down from a plan to direct the 2012 Academy Awards in the ensuing controversy. Since then, Ratner has worked with the organization and made a public service announcement to promote equality.